A few days ago I posted about Dial's Coconut Water & Bamboo Leaf Extract, where I both got the soap and the body wash. And since the glycerin soap was the first one that I tried, this will be the first installment of my product review. It was odd when I opened the first box of this soap. All along I thought the soap was white, similar to the one on the packaging. I didn't expect that it would turn out as green - a light moss green to be exact. But there is one thing that really caught my attention, and that is the scent. Never in my life have I thought that I would love a Coconut scent on a soap. You see, I prefer a citrus-fruity scent and this type of scent is my least favorite - like those in virgin coconut oil and other products that contain coconut ingredients. But don't get me wrong, I do love coconut mixed in drinks, food, or desserts. It's just that not on products like lotions, soaps, and shampoos. But this specific soap has a very distinct cool & not-too sweet refreshing coconut scent that really made me change my mind. It doesn't have a strong coconut-y scent which is so so fine with me. And the scent does linger, just like their most-loved gold soap bar. When I finally get to use it for the first time, I was quite impressed that this specific glycerin soap lathers so well, that it lathers better than a regular soap bar. A few rubs of this soap gets your skin soapy right away. I also love that it doesn't have a slippery and sticky after-rinse feel. And right after I used it, the soap didn't leave my skin dry. And even though it was my first try, my skin already felt smooth and moisturized, living with their promise on keeping my skin hydrated. This soap also goes a long way for us. 1 bar of soap is big enough to occupy 3/4 of my hand when placed on top of my palm. And even though hubby and I shared the soap and used it twice a day, the soap lasted us for about 2 weeks before we opened a new one. So, 1 pack is good for a month and a half use for us. Also, the soap doesn't melt easily, which is a plus for me. Now, the price though is a bit higher compared to our regular soap. These are sold in a pack of 3's for Php139, which makes a single bar cost around Php46. That's a 10-peso difference there, but with all the benefits this soap is giving, the amount is worth it. And if you're going to ask me if I'm going to recommend this product... It's definitely a YES! I'm actually giving some of these to my mom who is a big Dial Soap fan and to a friend whom I know would love this soap. I would also repurchase this when I used up all I have here with me. 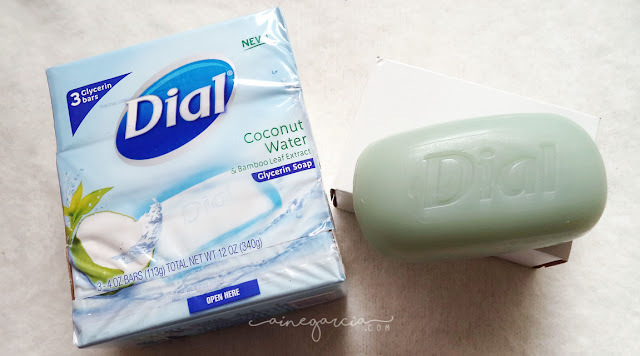 Like what I said on this post, Dial Coconut Water is my NEW favorite that I already said goodbye to my regular soap. This big change of heart is totally worth the experience I had on this product. And if you would like to try the same experience I had with this soap, Dial Coconut Water & Bamboo Leaf Extract Glycerin Soap is available in all leading supermarket. I promise you won't regret it! 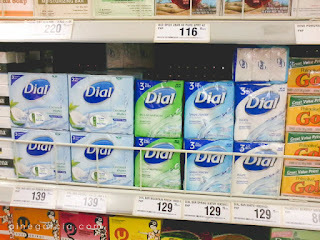 You might also want to check out my intro about Dial Coconut Water here, and you can read my review of the body wash here.